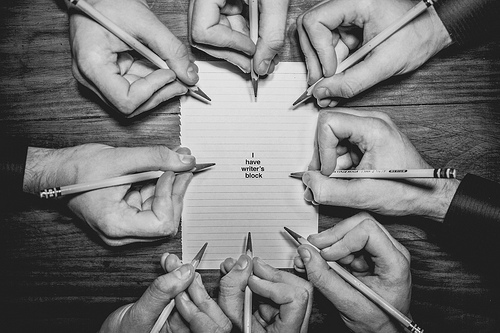 The trials and repercussions of the Volkswagen Group of brands re. emissions have been well documented but that didn’t stop them becoming the world’s largest manufacturer of vehicles, with 10.74 million vehicles produced last year and 4,100,000 sold so far this year. In the UK so far this year VW has sold 141,402 new cars, an increase of 10.58% over the same period last year in a new car market down by 4.1%. The VW brand in the UK is the second highest selling after Ford but now well ahead of Vauxhall. Much of the VW brand’s sales impetus has come from introducing a wide range of new models. Already this year we have the new Polo supermini, T Roc compact SUV, Tiguan Allspace seven seat SUV, Polo GTi, up GTi and now the Touareg large SUV. 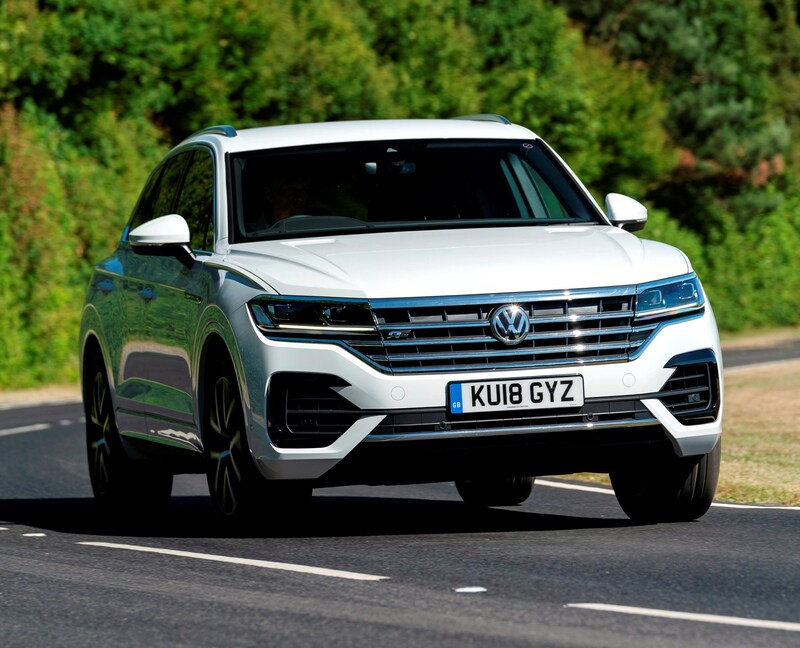 The Touareg first went on sale in the UK in 2003 and last year 3,689 units were sold in the UK and 45,594 have been sold since it was first launched, out of a one-million global sales total. 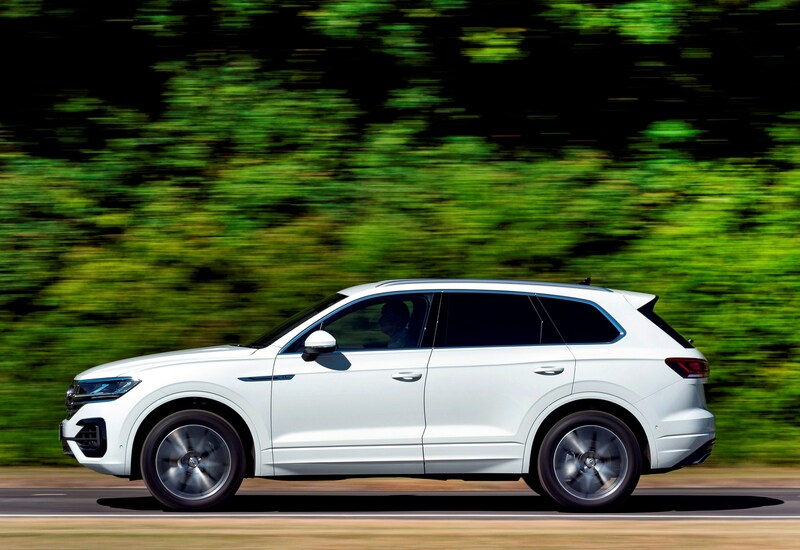 Its main premium brand competitors, VW UK says, are the Volvo XC90, BMW X5, Mercedes GLE-Class, Jeep Grand Cherokee and Land Rover Discovery, but of course we can add the Audi Q7 models as well. 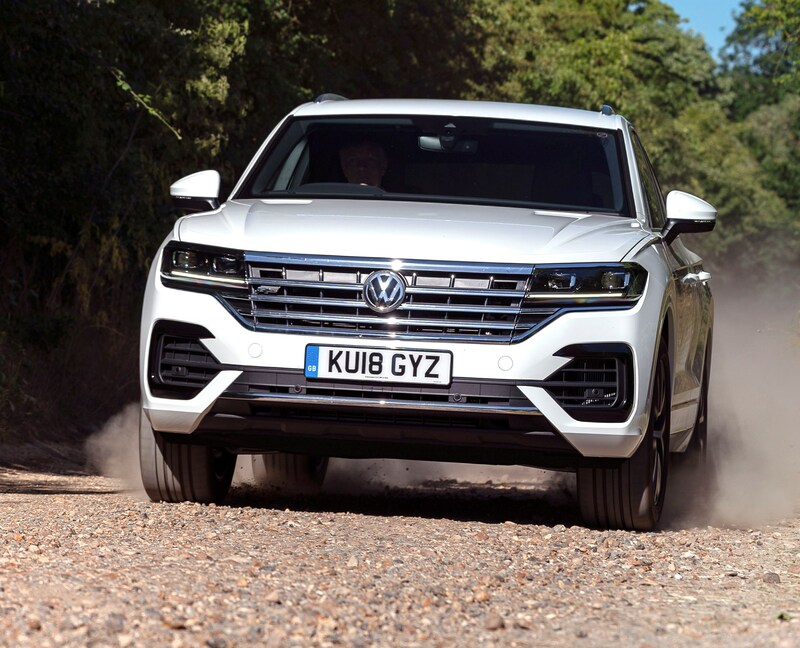 Now on sale the third generation Touareg will be available with a range of potent V6 engines coupled with an eight-speed automatic Tiptronic gearbox and 4Motion all-wheel drive. Initially the five-seater large SUV is available with a 3.0 litre V6 286 hp turbodiesel engine, likely to be the best-selling unit, and soon a 231 hp version of the same engine will arrive. A 3.0 litre V6 340 hp turbo petrol engine will be available to order later this year, and to come potentially next year is a 367 hp plug-in hybrid powertrain. The new model is available with SEL, R-Line and the new likely best-selling R-Line Tech specification levels. The fleet/retail sales split is expected to be around 60% fleet and the petrol/diesel engine split, when all engines are available next year, will be 80% diesel. On-the-road prices range from £48,995 for the forthcoming 231 hp turbodiesel with SEL equipment up to £58,195 for the 286 hp turbodiesel with the top new R-Line Tech spec and that is the version likely to be the best-selling model overall – and the model VW UK provided for us to test drive. A current PCP offer for this top spec version includes a deposit contribution by VW of £3,000 and that results in a £499 monthly payment fee over three years. 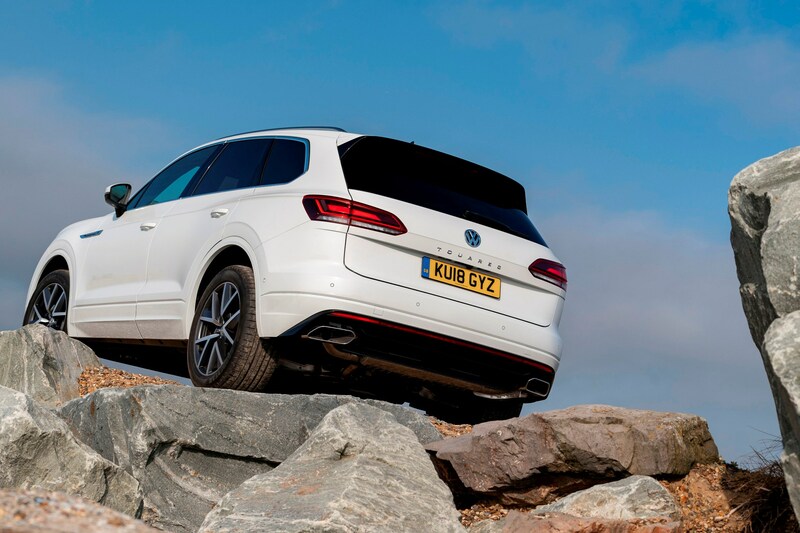 The new Touareg sits on the VW Group’s modular longitudinal matrix (MLM) platform used for high end models. It is wider and longer than before with a length of 4,878 mm or 16.00 ft (+77 mm or 3.03 in), 1,984 mm or 6.51 ft wide (+44 mm or 1.73 in) and 1,717 mm or 5.63 ft high (-7 mm or 0.28 in). The five doors, five seat design offers a 1,051 mm (3.45 ft) load length with 810 litres (28.60 cu.ft) of boot space with all five seats raised and 1,800 litres (63.57 cu.ft) with the rear seats folded down. The rear seats can slide by up to 160 mm (6.30 in) fore and aft to create more space or legroom and the angle of the rear seat backs can be adjusted in three stages up to 21 degrees. The kerb weight is 2,070 kg (4,564 lb) and it has a maximum braked towing weight of 3,500 kg (7,716 lb). The exterior dimensions give a well-balanced look to the vehicle, certainly it’s big and bold and makes an impressive statement in kerb appeal terms but perhaps there is too much brightwork to the wide front grille to be subtle; sometimes less is more in premium brand styling terms. Inside it’s probably the highest perceived quality the VW brand has achieved and it certainly looks and feels premium class with big comfortable and supportive seats, with leather upholstery and contrasting stitching. Found in top spec versions, or as an option on other versions, is a new Innovision Cockpit design with a 12-inch digital instrument cluster called Active Info Display and a 15-inch TFT touchscreen with the Discover Premium infotainment system providing digital operating information, communication and entertainment functions. Whichever version is chosen the level of spec is comprehensive and includes the now usual driver support systems – for example alert, partly automated steering, emergency braking are available – and much more; too much in fact to include in this brief first UK test drive review. Under the skin the mechanicals include new anti-roll stabilisation bars which are electromechanically controlled to react to different cornering speeds. My test car was fitted with the air-suspension and rear wheel steering and Dynamic Chassis Control which costs an extra £2,370 but is probably a worthwhile addition because the handling and ride qualities were impeccable for such a large vehicle. 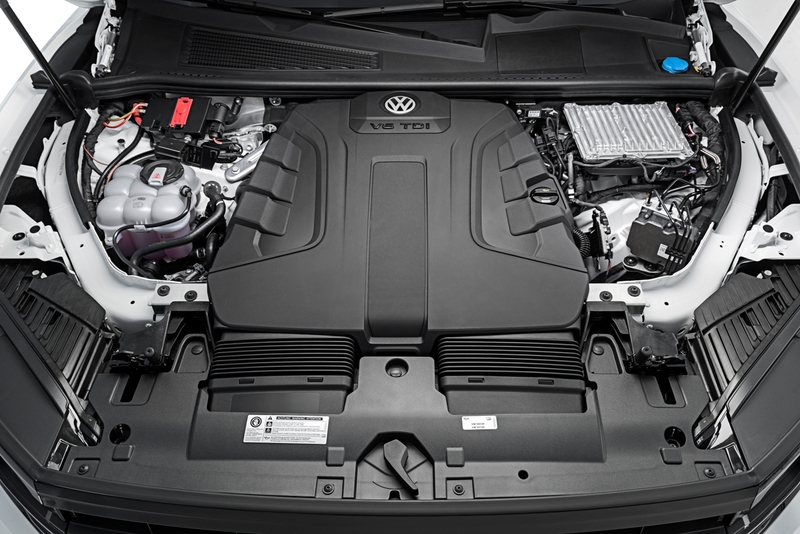 The 3.0 litre, V6 TDI 286 hp turbodiesel engine is a real gem and provides uncompromised muscle with torque of 600 Nm (443 lb.ft) from 2,250 rpm. Drive to all four wheels is through the 4Motion system via an eight-speed Tiptronic auto gearbox which works seamlessly with the high torque engine. The system includes a centre differential lock with asymmetric dynamic torque distribution controlling the flow between the front and rear axles – to a maximum of 70% to the front and up to 80% to the rear axle. This helps with cornering stability, acceleration and of course with a useful amount of off-road driving capabilities. As for performance top speed is 146 mph and zero to 62 mph takes only 6.2 seconds. The new official WLTP Combined Cycle regulations in operation from this month for all new cars shows the fuel consumption figure of 42.8 mpg with CO2 emissions of 173 g/km. This means that the VED diesel rate first year road tax is £1,240 before reducing to the Standard rate of £140 but to that latter figure has to be added a further £310 annual charge for five years as the vehicle costs over £40k. The company car Benefit-in-Kind tax is the maximum 37% rate. The insurance group is 42E and the warranty is an ungenerous three years/60,000 miles. Overall the new VW Touareg large SUV is very impressive in all areas, especially in driving refinement. I found it eerily quiet with very little noise from the engine transferring into the cabin, even during hard acceleration. Whilst cruising at 70mph it was virtually silent and the road noise was just as low. All-in-all it’s very impressive and a very serious contender in the premium class large SUV sector. For: High technical specification, much improved interior quality, roomy, comfortable, refined, superb engine/gearbox combination, improved in almost every area. Against: No seven-seat version, ungenerous warranty, gets expensive if too many options are fitted, my test drive fuel economy was not close enough to the supposedly new and more realistic WLTP official figure. Volkswagen Touareg R-Line, 3.0 litre V6 TDI, 4Motion 286 hp, eight speed auto. Engine/transmission: 3.0 litre, V6 turbodiesel, 286 hp, 600 Nm (443 lb.ft) of torque from 2,250 rpm, eight speed auto with 4Motion all wheel drive. Performance: 146 mph, 0–62mph 6.2 seconds. Fuel consumption: WLTP Combined Cycle 42.8 mpg (31.1 mpg on test over winding country roads). 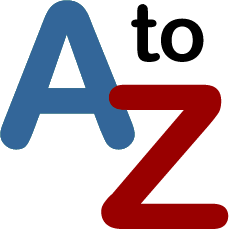 Emissions and taxation: CO2 173 g/km, VED First Year diesel rate road tax £1,240, Standard rate £140 + £310 supplement as it costs over £40k, BiK company car tax 37%. 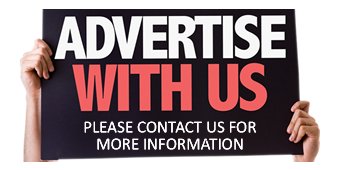 Insurance Group: 42E. Dimensions/capacities: L 4,878 mm (16.00 ft), W 1,984 mm (6.51 ft), H 1,717 mm (5.63 ft), boot/load space 810 to 1,800 litres (28.60 to 63.57 cu.ft), braked towing weight 3,500 kg (7,716 lb), five doors/five seats.